My maternal grandfather, Peter B. Hall, died in 1977 at the of 76, when I was 11 years old. Grandpa had suffered from crippling arthritis all the time I can remember knowing him. He departed this earthly life when he lost the battle with cancer. One thing I remember about Grandpa is that whenever we went to visit, he spent most of his time reading his old, worn Bible. You see, Grandpa was mostly a prisoner of his chair due to the arthritis, but I don't remember ever hearing him complain. Instead, I remember him cradling that Bible on his gnarled, arthritis-stricken legs. What a lesson for me to remember! The other thing which stands out in my memory when I think of Grandpa happened when I was probably six or seven years old. Everyone was in the kitchen just about to eat lunch--everyone except Grandpa and me. Grandpa's lunch had to be brought to him on a tray, for it was quite difficult for him to come to the table. When my mother called for me to go eat, I started toward the kitchen but something made me stop. There sat Grandpa . . . all alone. Then I did something I had never done before without urging. 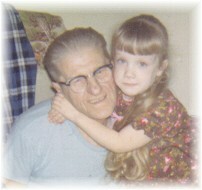 I went to Grandpa's chair, gave him a hug, and simply said, "I love you, Grandpa." Then Grandpa did something I neither expected nor understood at the time--he wept. My one small act of kindness meant the world to him. This was another priceless life lesson I learned from Grandpa. We may never know how deeply a random act of kindness may affect someone else. What if I had passed by Grandpa's chair without listening to that inner voice? How many times since then have I ignored that inner voice and thrown away a blessing for myself and someone else? The most touching life lesson learned from Grandpa, though, I didn't experience first-hand. My mother told me this true story from her childhood. It was 1937 and times were rough, indeed. Even so, Grandpa's faith in God remained steadfast. My mother remembers the evening Grandpa came home from church with serious news for Grandma. He had put their very last nickel in the collection plate. What a strong faith he must have had in God and His willingness to provide for His children! Grandpa assured Grandma that God would provide. And God did provide. The very next day, the minister's wife came to the house and paid Grandpa $5 in advance for carpentry work. Five dollars was quite a bit of money in those days, when a child's pair of shoes cost less than a dollar. God had replaced that nickel one-hundredfold. All it took was Grandpa's faith. Peter B. Hall was never wealthy or famous. But his legacy for me was much more important than wealth or fame. His legacy was the love of God's Word, enjoying the kindness of God and others to the fullest, and an undying faith in God's ability and willingness to provide for our needs. How rich I am to have inherited this legacy from Grandpa!